"Only With You" by Angel Olsen. "You and I" by Wilco featuring Feist. This song was in the latest season of Love on Netflix — bringing me back to my family Wilco days. "Mystery of Love" by Sufjan Stevens. I waited forever and a half to see Call Me By Your Name. I think I needed some emotional stability so I wouldn't sob the entire movie. This song paired with the scene, it gave me an enormous swell of feelings. I love Sufjan. "I Was Born A Unicorn" by The Unicorns. I Hid Who I Was for So Long. Until I Became a Cook. By Andy Baraghani. This is a wonderful piece. I feel very inspired by my coworkers. 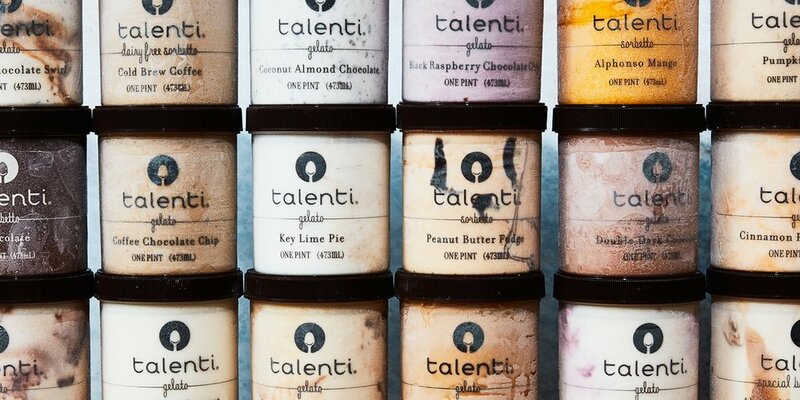 If you're curious how the Talenti Taste Test I participated in went down, this is Joe's full report. I'm still more of a chocolate and peanut butter varietal fan. This week is brought to you by almonds. I'm in love with this almond-based dip/spread called Bitchin' Sauce — all the flavors are delicious. I participated in an almond butter taste test (grocery store brands are top ranking: TJs. Whole Foods 365, Costco, etc.). I devoured a variety of "cocoa-dusted" almonds that were sitting next to my desk (in espresso, maple, and mayan) — I didn't adore them, but they were there. I also cannot stop eating dates. Last Monday I was walking to work and thought, I should revive my fashion game now that I go to a big fancy building for work. A couple hours later, I was pushing a cart full of toasters down an empty hallway, wearing jeans, my It's-It sweatshirt, and my decade-old purple vans, and guess who walks right by me? Anna Wintour! In the flesh, full-on sparkling tweed skirt suit. She definitely didn't look me in the eye. At least I do really love that sweatshirt. Live: I went to this show last Friday: LAS CULTURISTAS LIVE: I DON'T THINK SO, HONEY! Wow! Dozens upon dozens of comedians and performers take one minute each to go off on culture. My face hurt from laughing so much. My hands hurt from clapping so much. Now I am in a deep dive of the Las Culturistas podcast and thoroughly in love with the hosts and concept. On Netflix: I consumed season three of Love in a couple of days. I think I enjoyed it more toward the end of the season, and maybe not as much as the first, but still a fan. HBO: Week after week, High Maintenance is my favorite in television. The latest episode was bursting with weirdness and beauty and more than I could put into words. Poster and logo for 555 produced by Abso Lutely. Dogs: I saw an excitable husky in a window the other night and I keep passing the same apartment on a daily basis hoping to see it again. There are always so many great dogs in the city from Dalmatian puppies to scrappy mutts in sweaters to the sweetest looking Corgi in a backpack. I am a fan of them all. It is year of the dog after all. Scene from Maira Kalman's Max series — I've got a tattoo of Max, in the brown hat and coat. Her dog depictions are superb.